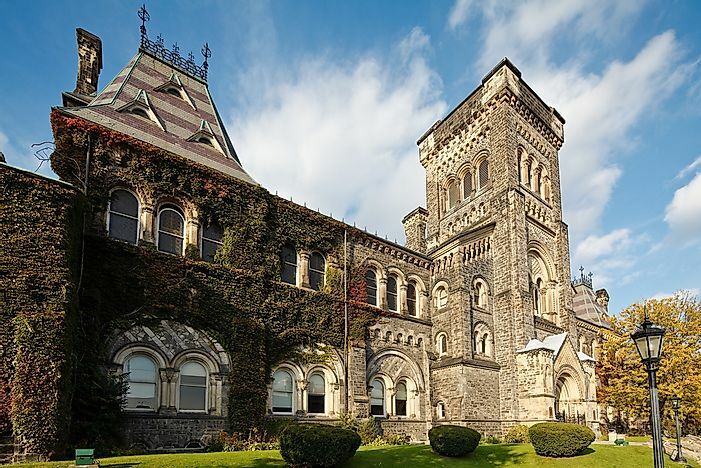 The University of Toronto is the largest university in Canada by enrollment size. The University of Toronto, the largest university in Canada. Canada is one of the most popular destinations for students seeking higher education. With consistent high-level spending on education, it boasts high standards of higher education, with several of its resident institutions featuring among the top 100 globally. As a bilingual nation coupled with a history of lenient immigration laws that encourages diversity and multiculturalism, Canadian universities are considered cheaper than any Anglophone countries hence attracting a large number of international students. The largest universities in the region are analyzed by the size of enrollment where the University of Toronto, University of British Columbia, and York University having the largest enrollments annually. The University of Toronto is the global leader in research and teaching offering over 700 undergraduate and 200 postgraduate degree programs to a cohort of over 60,000 students annually. The UoT has a longstanding reputation in scientific research and innovation being the birthplace of groundbreaking scientific moments as the discovery of insulin the invention of the electron microscope. UoT has produced five of Canadian Prime Ministers, celebrated global writers, and ten Nobel laureates. Laying claim to a global mindset, the university actively collaborates with other leading higher education institutions and industry partners around the world to provide international opportunities to its students. York University is the third largest public research learning institution in Canada with an average annual enrollment of 46,640 students. The university was founded in 1959 in the cosmopolitan city of Toronto. York University offers over five thousand courses in liberal arts, space engineering, global health, and digital media. Being a bilingual university, York promotes teaching through advanced and progressive learning, diverse choice of work and community-based empirical learning opportunities, and innovative course designs to its students. University de Montreal is a public research institution located in Quebec Canada. It was founded in 1878 as a satellite campus of Laval Université before becoming an independent in 1919 under a papal charter. UdeM is a French-language institution renowned for its contribution to research and innovation in different fields.It promotes education and learning through international agreements with other institutions of higher learning across the globe to encourage exchange programs. With the current demographic and structural complexities of the Canadian education system, the future is expected to be more complex as compared to the past. With the declining fertility rates in the country, there will be pressure in the education system, which will largely comprise of immigrants whose first languages will not be English and French. Many learning institutions are expected to develop innovative policies to promote online education. Institutions with large enrolments capacities can roll out open and distant learning education programs for sustainable education in the future.